It's not perfect, but I'm beyond pleased all the same. It worked. I set three faceted stones together. I soldered three prong settings to a filigree band, and it looks very pretty. 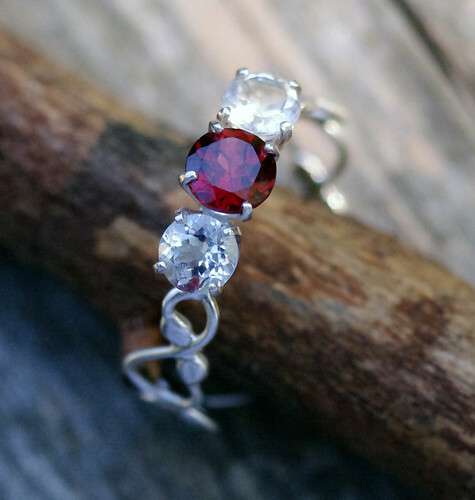 I set it with a 6mm rhodolite garnet and two 5mm white topaz gemstones. Next time, I'd make the band out of the next gauge larger for a sturdier end result. This one isn't exactly flimsy, but the band has a little more play under pressure than I'd like. 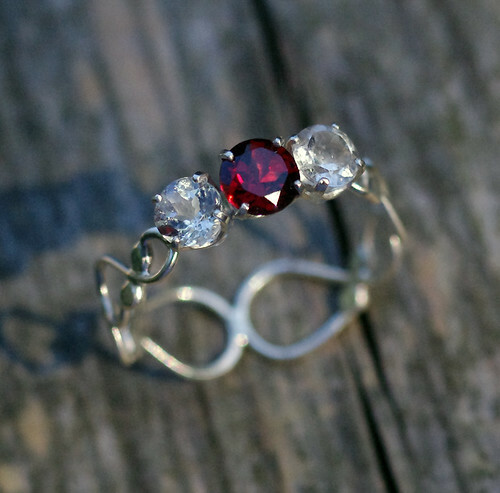 The ring is a size 10, and I'm offering it in my Etsy store at a special price, since it is a prototype: garnet and white topaz three stone ring.